What Is Six Month Smiles® Short Term Orthodontic Treatment? See the gallery of before and after Orthodontic treatment and smile makeovers by Fox Lane Dental Care. 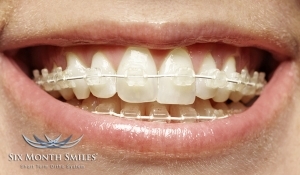 Q: How can teeth be straightened in only six months with adult braces? A: The Six Month Smiles technique employs the latest technology and techniques in dentistry to move your teeth quickly and safely with clear adult braces. The key components of the treatment are the use of unique, clear braces and a primary focus of moving the teeth that show when you smile. Q: Six months sounds good, but will I still have a mouth full of metal braces for the whole time? A: No! Six Month Smiles uses clear braces that are barely visible to gently straighten your teeth. Q: How are Six Month Smiles braces more comfortable than regular braces? A: Six Month Smiles uses low force to move teeth gently. Many people think that the accelerated braces treatment means simply “tightening” regular braces to get the teeth moving, but that is not true. Six Month Smiles utilizes standard orthodontic mechanics, but with an emphasis on the cosmetic appearance of your teeth rather than the position of your bite. Q: Do Six Month Smiles braces damage the teeth, roots, or gums? A: There are no more risks of root damage or other issues than those associated with traditional orthodontics. Since the forces used with Six Month Smiles braces are lighter and teeth are seldom extracted, there are actually even fewer risks involved with Six Month Smiles. A: There is no catch. 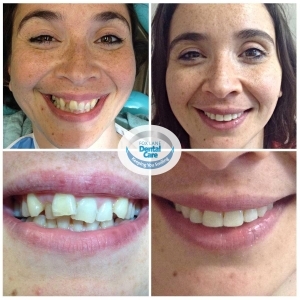 If you are an adult (16 years and older) with crooked or spaced teeth and you’re not looking for a major alteration to your bite, this could be the solution for you! Most adults ARE candidates for Six Month Smiles. Cost: from £1700 (upper or lower brace, upper or lower fixed and removable retainer, teeth whitening- normally £300). Contact us to find our more and book your appointment today. Our Mission is to provide quality dental care to the local community based on a high-trust/low-fear, long term relationship for quality, family-friendly Dental Care. Request your appointment today. 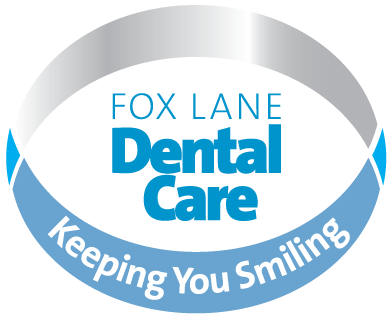 Copyright 2014- | Fox Lane Dental Care | All Rights Reserved.